I discovered meal planning several years ago and ever since, have planned out my monthly meals. This routine helps me control my grocery bill and my freezer contents by using what I have and planning my grocery shopping. Friday nights are Nacho Night, Thursday is Leftover Night and Wednesday is usually Soup Night (unless it's mid-summer and then it transitions to Salad Night). So today being Wednesday, it must be Soup Night. It was a beautiful day here in Southeastern North Carolina; Spring is clearly walking through the front door, or at least getting ready to ring the doorbell. I was really looking for a soup that would feel ‘Spring-ish'. To me, that meant a broth based, lighter soup with seasonal vegetables. I was also looking for something that would use what I had in the house as I didn't want to make a run to the grocery store. I always have ground turkey and chicken broth and I usually have fresh spinach. 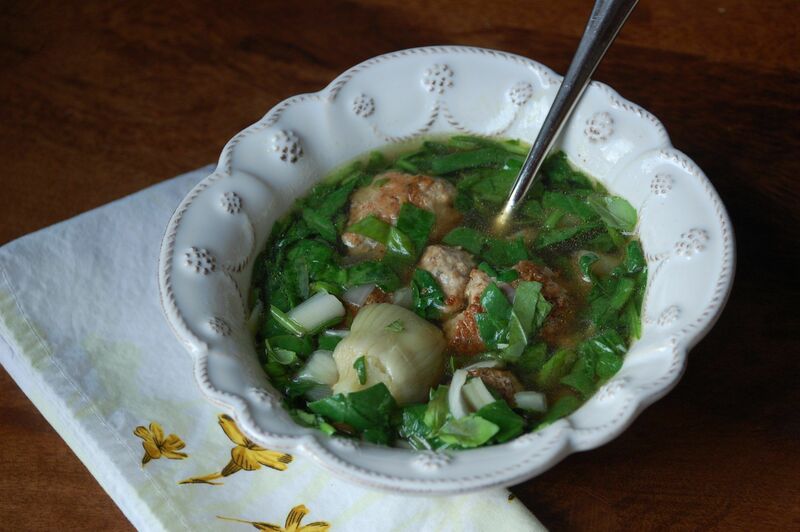 So I got busy in the kitchen and came up with this recipe for an Italian Turkey Meatball, Spinach and Artichoke Heart soup that was light, yet filling and very ‘Spring-y'. I used almond meal instead of bread crumbs as I over-indulged on bread yesterday. You could easily swap the almond meal for bread crumbs. I have to say, these little meatballs were outstanding! So often turkey meatballs are rather dry and chewy. I think the amount of cheese and egg relative to meat made these so tender and really tasty. It had to be the cheese which, when combined with a good fry in oil, also resulted in the great crunchy exterior. I had a good 1/2 dozen while cooking them. A light soup with very tasty meatballs, artichoke hearts and spinach. Gluten-free alternative. Turn as each side browns. About 10 minutes before serving add spinach and let it wilt. For serving, divide artichoke hearts and meatballs among your bowls. Ladle broth over and finish with shredded basil. I really liked a sprinkle of parmesan cheese on top as well. These meatballs are outstanding on their own. The cheese in them helps form a great crust. In order to keep that crunch, don't add them to your soup too early. If you have leftovers, refrigerate them separately and add them in at last minute, after heating. I added the artichokes at the end as well to keep them intact. They can be rather delicate and I was looking for larger pieces. If you don't mind them separating in the cooking, you can add them to your pot when you add the spinach. Thank you dear Nan! Your input is so appreciated! Have a great day.